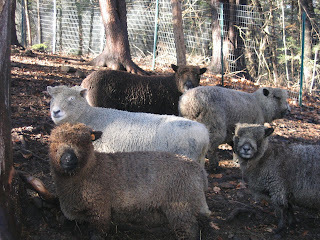 Our Olde English Babydoll Southdown Sheep, from the bottom in the front is "Rose", behind her is "Sweetie", then "Fred", next to him is "Scar" and then in the bottom right is "Belle". Hopefully in the spring, "Sweetie" and "Belle" will have lambs. They were bred in October so they should lamb in March early April. These guys are awesome and sweet, they are known for being gentle. As you can see they come in different colors but are more known for their color classifications which is black and white. "Sweetie" is the only white one so you can see the range of colors they can come in. Their wool is just wonderful, easy to spin and work with. Although, maybe medium.com/ initially we should take a look at Official Website what a vacuum cleaner sealer is Kitchen gadgets review: FoodSaver vacuum sealer as well as what it can offer your house. Vacuum Sealer A vacuum sealant permits you to store food in Vacuum Sealer 2017 a vacuumed area. Though Mobdro Application is created Mobdro App for Android running system initially, it is not there in Get More google play. Factors could differ but you can Mobdro for Android not locate mobdro for android on google play.